RecipeTips.com's video demonstration, 'How to Store Fresh Asparagus,' teaches you the best way to store your fresh asparagus to make it last the longest. Hi. This is Laurie from RecipeTips.com. Today I am going to show you how to store fresh asparagus. 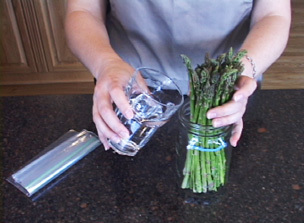 Using a mason jar or a glass or a small pitcher, place the cut side down of the asparagus into the jar. Pour approximately an inch of water into the bottom. The next step is to place a plastic bag over the top of the asparagus to keep them moist; then just place it in the refrigerator to keep your asparagus fresh. For more information on asparagus, visit RecipeTips.com.